Good catch, I’d forgotten the Steele “entertainment” mess. Personally I’m with Jon Stewart here; when Rush’s “base line” is “FemiNazi”; I’m not surprised, or further offended, by just about anything he can come up with. 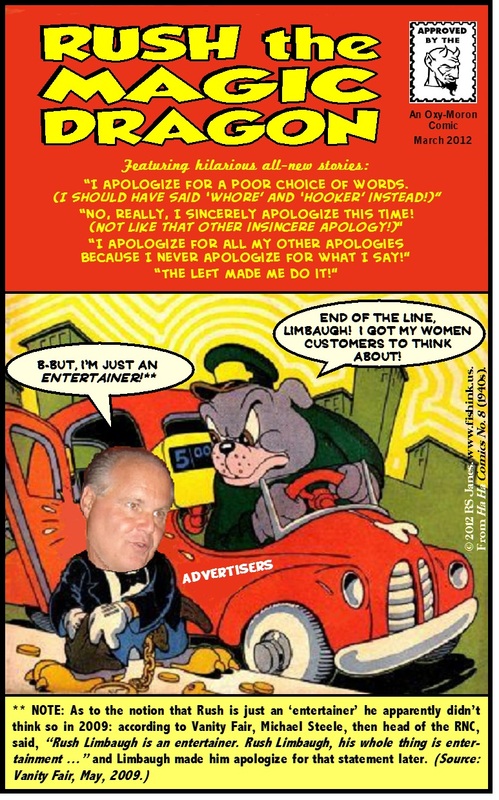 Just glad to see others noticing what Rush’s been saying all along. I think there were some other dust-ups over calling Rush merely an ‘entertainer’ back in the day, but I didn’t Google them. I couldn’t have fit them in this piece anyway.